Professor Liévanos earned his A.A. in Liberal Arts from Allan Hancock College (2002), his B.A. in Sociology from Fresno State University (2004), and his M.A. in Sociology (2007), graduate certification in Air Quality and Health (2010), and his Ph.D. in Sociology (2013) at the University of California, Davis. Previously, he lectured in the Center for Public Policy and the Department of Culture and Communication at Drexel University (2011 to 2013), and he was an Assistant Professor of Sociology at Washington State University (2013 to 2016). 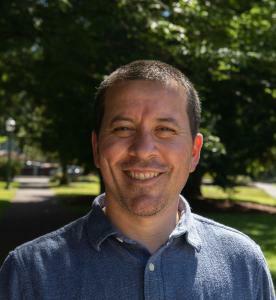 Currently, he is a faculty affiliate at the University of Washington Center for Studies in Demography and Ecology and an Assistant Professor of Sociology at the University of Oregon. His research focuses primarily on the organizational, institutional, demographic, and spatial dynamics of environmental and housing market inequalities and on the social movements and policy processes that attempt to address such inequalities in the United States. These general research interests are reflected in his ongoing projects on (1) relational and intersectional approaches to studying various spatialized inequalities, (2) cumulative pollution burden, (3) energy injustice and unequal resilience in the electrical grid, and (4) the political and technoscientific aspects of environmental justice policy development and implementation. His general interests are also evident in newer projects on (1) the "socio-nature" of real estate markets; (2) the sociospatial dimensions of food insecurity, climate injustice, and the recent housing crisis; and (3) the use of big data to monitor community mobilizations around emergent environmental health threats. Anna Davies, Gregory Hooks, Janelle Knox-Hayes, and Raoul S. Liévanos, eds. Expected July 2020. Special Issue: “Riskscapes and the Socio-Spatial Challenges of Climate Change.” Cambridge Journal of Regions, Economy, and Society 13(2). Liévanos, Raoul S. 2019. "Air-Toxic Clusters Revisited: Intersectional Environmental Inequalities and Indigenous Deprivation in U.S. Environmental Protection Agency Regions." Race and Social Problems. DOI: 10.1007/s12552-019-09260-5. Liévanos, Raoul S. 2019. “Green, Blue, Yellow, and Red: The Relational Racialization of Space in the Stockton Metropolitan Area.” Pp. 224-253 in Relational Formations of Race: Theory, Method and Practice, edited by N. Molina, D. Martinez HoSang, and R. Gutiérrez. Berkeley, CA: University of California Press. Liévanos, Raoul S. 2018. “Impaired Water Hazard Zones: Mapping Intersecting Environmental Health Vulnerabilities and Polluter Disproportionality.” ISPRS International Journal of Geo-Information 7(11), 433. Liévanos, Raoul S. 2018. “Retooling CalEnviroScreen: Cumulative Pollution Burden and Race-Based Environmental Health Vulnerabilities in California.” International Journal of Environmental Research and Public Health 15(4), 762. Liévanos, Raoul S., Pierce Greenberg, and Ryan Wishart. 2018. “In the Shadow of Production: Coal Waste Accumulation and Environmental Inequality Formation in Eastern Kentucky.” Social Science Research 71:37-55. Liévanos, Raoul S. and Christine Horne. 2017. “Unequal Resilience: The Duration of Electricity Outages.” Energy Policy 108:201-211. Liévanos, Raoul S. 2017. “Sociospatial Dimensions of Water Injustice: The Distribution of Surface Water Toxic Releases in California’s Bay-Delta.” Sociological Perspectives 60(3):575-599. Liévanos, Raoul S. 2015. “Race, Deprivation, and Immigrant Isolation: The Spatial Demography of Air-Toxic Clusters in the Continental United States.” Social Science Research 54:50-67. Related Media Coverage: WSU College of Arts and Science News; WSU News Highlights; International Business Times; Newsroom America; University Herald; Common Dreams: Breaking News & Views for the Progressive Community; The Atlantic’s CityLab; TakePart: Stories that Matter, Actions that Count; Houston Chronicle’s La Voz Online; Univision’s “Fusion”: Pop Culture. Satire. News; KUOW 94.9 FM Public Radio: Seattle News & Information (Taped Interview, 11/2/15); News-Medical.net; OPB: Oregon Public Broadcasting; Weather.com, Health News; Univision News - Environment. Liévanos, Raoul S. 2012. “Certainty, Fairness, and Balance: State Resonance and Environmental Justice Policy Implementation.” Sociological Forum 27(2): 481-503. Liévanos, Raoul S., Jonathan K. London, and Julie Sze. 2011. “Uneven Transformations and Environmental Justice: Regulatory Science, Street Science, and Pesticide Regulation in California.” Pp. 201-228 in Technoscience and Environmental Justice: Expert Cultures in a Grassroots Movement, edited by G. Ottinger and B. R. Cohen. Cambridge, MA: Massachusetts Institute of Technology Press. Shilling, Fraser M., Jonathan K. London, and Raoul S. Liévanos. 2009. “Marginalization by Collaboration: Environmental Justice as a Third Party in and beyond CALFED.” Environmental Science and Policy 12(6): 694-709. London, Jonathan K., Julie Sze, and Raoul S. Liévanos. 2008. “Problems, Promise, Progress, and Perils: Critical Reflections on Environmental Justice Policy Implementation in California.” UCLA Journal of Environmental Law and Policy 26(2): 255-289.